Meet the JakPak, a Jacket with multiple personalities disorder. JakPak is one of the most creative products I have seen in a long time. 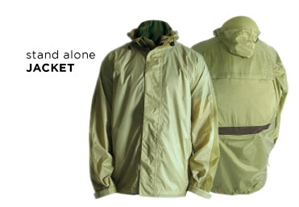 It’s a jacket that turns into a sleeping bag, that turns into a tent/bivy sack. JakPak fully deployed as tent. After playing with one for a couple weeks I’m not going to tell you this is the perfect, but it is pretty cool. JakPak Review coming in the next couple of months.